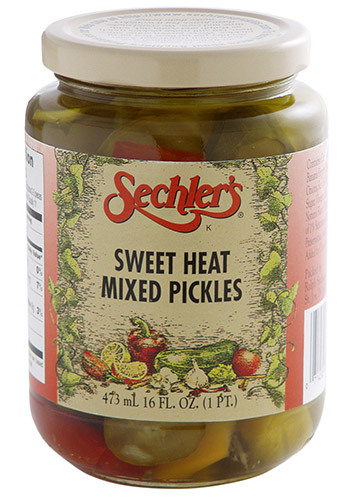 16 ounce Sweet Heat Mixed Pickles. Our candied mix of pickles, banana peppers, pepperoncini, cauliflower, red bell peppers, and onions. Sweet Heat won the Midwest Food Processers' Best New Product Award of 1993. Sodium Metabisulfite added for color retention and Polysorbate 80. From Katie of Cleveland, Ohio on 4/12/2019 . I bought a 12 pack of the Sweet Heat Mixed Pickles for my boyfriend as a birthday gift. The jars of pickles were VERY securely packed and there was no damage in shipping. They also arrived very quickly. Thanks! From Anonymous of AUSTIN, Texas on 4/1/2019 . The 4 pack was sent as a gift to a lover of the sweet heat pickles. The ordering process was easy, shipping as scheduled, and the recipient loved them, although her daughter took a jar back to college!!! From LaJ of Fort Worth, Texas on 2/21/2019 . I've been eating these pickles since I was a little girl from Kreuz BBQ in Lockhart, Texas. I LOVE THEM!! I had some friends to visit from LA and tasted them and now I have to send them jars as well. I just sent four and 2 jars are already gone. I get them at the olive bar here at a gourmet grocery store called Central Market and they go so fast. Needless to say, I will be ordering more to ship to the poor poor people in California. Outstanding taste. Matches many foods. From Anonymous of Austin, Texas on 2/10/2019 . Though our stores sell a wide variety of pickles, none match the flavor and crisp texture of these. We gladly order Sechler's pickles to be shipped in for the utmost quality they provide. My husband is addicted to these. From Anonymous of Middletown, Ohio on 1/10/2019 . These are delicious. Fresh and tasty. Hits all the taste buds.